All of the rooms in Hostal Horizonte have private bathrooms and TV, free Wifi and Air Conditioning. Safes and hair dryers are available on request. Horizonte has a 24-hour reception, tour desk and an internet point. Sant Antoni port is just 500 meters away. From there you can get a ferry to Denia on mainland Spain. Ibiza Airport is about 15 km away. The property is suitable for young people. The property is located close to the lively center of San Antonio with the many shopping and entertainment venues of the town only about 5 minutes away. There is also a public transport stop, which takes visitors to the island's capital, to be found just 600 m away from the property. In addition, the nearest beach is only around 500 m away. 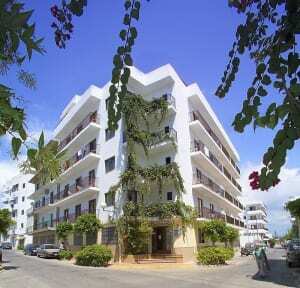 The center of Ibiza Town, as well as Ibiza airport, is approximately 22 km away. Perfect place in San Antonio. It wasn't too far from the docks, but just far enough not to hear all the music and partying down the street. The staff was super friendly and helpful. The only thing I might be cautious about it is leaving your key with the front desk. They do not check ID to pick up keys and only for your room number. I would def stay here again! Lovely, clean, tidy family run hostel. For what we paid we got a lot more than expected!! Facilities, They had a pool but we booked the hostel literally to sleep shower & get out so was perfect. Also the facilities to hand obviously reflected in the price!! Perfect little hostel just far enough away from the music where you can get some peace but not too far away! All within walking distance. I was at this Hostel during August which is a very expensive time to be in Sant Antonio. The price was very reasonable and the location was very good. The staff were very helpful and friendly. Only thing missing was a kettle in the room to make a cup of tea in the morning, next time I will take one with me. 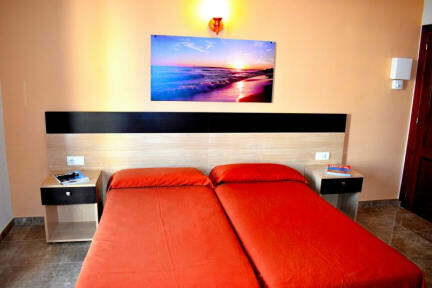 Brilliant hostal, clean and modern close to the strip..5 min walk. Nice pool thats looked after, friendly staff I would have classed it as a hotel.. What's the difference, less people is sometimes a good thing. I stayed on my own and felt safe..
Just a basic hotel with a swimming pool. Nothing fancy but great value for the money. Had working air conditioning thankfully. Close to everything too. About 7 min walk to the ocean. Very good place to stay, nice pool! Staff are very friendly and helpful, only issue is you are unable to bring guests back into your room. Hotel clean and tidy, all you want from your ibiza hotel, staff all rude and ignorant, also once we got to the hotel, they made us pay an extra €150 even though we had in black and white the price we agreed with hostel world, she wouldnt even look at it and told us to pay or get out. Awful, definately dont expect that when you go through a company like this.